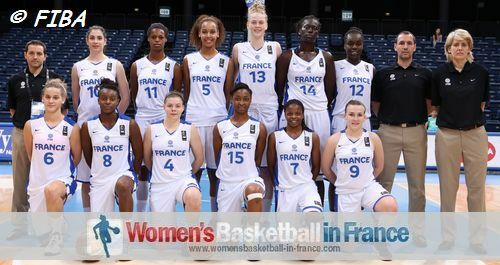 France beat Spain (62-58) in the first semi-final of the 2013 FIBA U19 World Championship for Women in Klaipeda. This is the first time in the history of this competition that France have qualified for the final. France qualified for the U19 World Championship as winners of the 2012 U18 European Championship, while Spain sneaked in as the 5th placed team. However Spain had been without Astou Ndour in 2012. So neither team came into this semi-final with a favourite tag. Despite an electrifying first quarter, the game did not live up to its billing. Both teams struggled from the free-throw line and the three-point shooting was well below standard. However France will not complain because the game turned in their favour for good with a three-ball by Lidija Turcinovic with 60 seconds to play. The World Championship video clips included in the right menu are provided by FIBA. The first ten minutes were played at a high tempo with neither coach having the opportunity to call a time-out. Spain missed their first two shots while France scored at the first attempt with a base-line jumper from Lidija Turcinovic. The first quarter turned into an Olivia Epoupa show with 4 points and 4 assists as France won the quarter (20-15). The only problem for France was the 2 fouls called on Valériane Ayayi. During the second quarter Spain made the necessary adjustments that allowed France just 6 points. 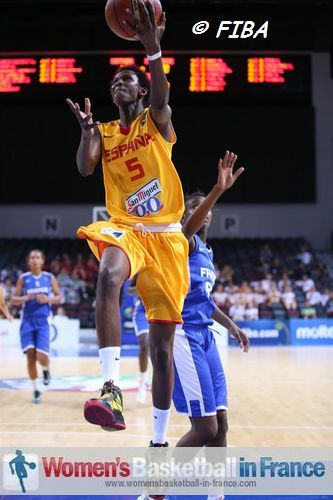 Astou Ndour (in picture) continued to hit her shots for Spain as her side came back onto the heals of France. Her team-mate Belen Arrojo was not having much luck from the free-throw line. Yet the last 2 points of the first half by Carlota Faussurie allowed Spain to walk into the locker room in front. By the end of the first half France did not make a single trip to the free-throw line nor used a time-out. Ndour scored the first 4 points of the third quarter for their largest lead of the game (31-26). France finally got to the free-throw line. Yet hitting just 4-from-11 during the quarter meant that that they had to work hard to get on the scoreboard from open play. When France did step on the gas and with an And-1 play by Turcinovic the momentum was in favour for France (39-35) with 3:55 to play in the quarter. Spain were fortunate that France missed so many free throws as they reduced the deficit to a one possession game (40-42) to close the third quarter. Despite foul problems for Ayayi, she exploded with a 5-point burst and give France their biggest lead of the game (51-44) with six minutes to play. Ndour (27 points and 10 rebounds) took over for Spain at both ends of the court with 7 points , 1 block and 1 steal to draw the teams level (51-51) with four minutes to play. The game became scrappy as both sides traded basket for basket until the last minute (55-55). 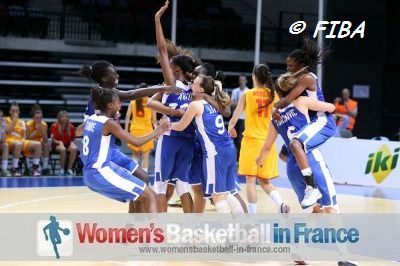 France got the final breakthrough off a fast break ending with Turcinovic knocking down a baseline three-pointer. Spain had a few chances to tie the match but missed the opportunities. So France celebrated a historical victory.